The Drunken Severed Head: "The Last Picture Show"
Everything here on Spring Hill is covered with a blanket of snow, and with the trees across the street being denuded by winter, I can see through the bone-like branches to another hill a few miles away. From my porch, I can see that on the side of that hill is a cemetery. I love seeing cemeteries when their is snow on the ground. Somehow they are more beautiful then. Slate has an interesting essay on the "surprising beauty of portraits on gravestones" with a good slideshow attached. (The pic just above comes from the slideshow.) Check it out here. And to see some very odd gravestones, click on this link to a Mental Floss item. 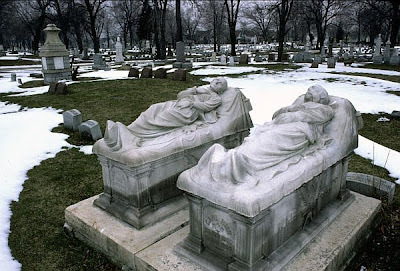 Let's go to Homewood Cemetery soon; prize-winning surnames on tombstones that I've seen: "Tomb" and "Coward"
Yeah, let's! Soon, soon, soon! Bring the cocktail olives, I'll supply the rest!